We remember wanting a piece of this Freedom Mini action way back when it was announced last year, but not being able to find it anywhere. But good news shoppers, it's finally available from X-TremeGeek for $84.97. 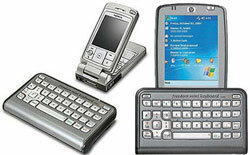 To recap, the Freedom Mini is a Bluetooth mini-keyboard for cellphones and PDAs that don't have a built-in keyboard. It's about the length and width of a credit card, but the thickness of five credit cards. Check their site for a complete list of compatible devices.